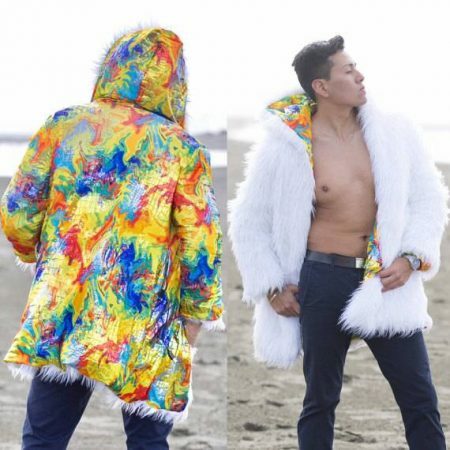 Meet Glitch – one of a kind smart coat, which was made specially for Silicon Valley Fashion Week to show possibilities of wearable art and tech. It has 300 TCL (Total Control Lighting) LEDs inside. LEDs are attached to controller with more than 30 different modes to play with! 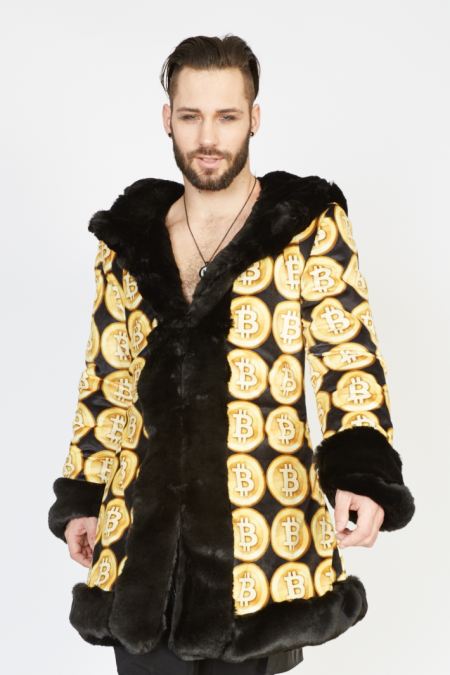 Moreover, anything what’s on your computer screen can be showed on the coat! It is literally a wearable screen with 300 pixels ? You can become fire or water in it, have Packman eating pixels or bird moving wings up and down… Anything! All LEDs are mapped in a special free software. To start playing – download software, save your favorite videos on SD (included), place SD into controller – BAM! 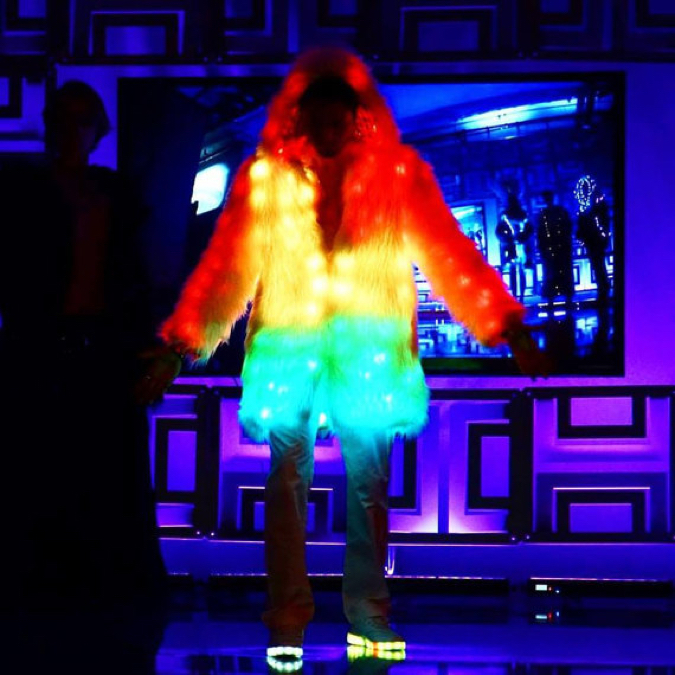 I used the most protected and strong LEDs, so can lay on the coat, twist and throw it – they won’t break! But you need to be a strong guy – the weight of the coat is about 30lb. SIZE – Men’s Large (might be a bit smaller due to electronics inside). To make it the brightest I recommend to use it with 4 rechargeable batteries (I include them as well). It lasts through 1 night on a single charge. Charging USBs cables are included as well. Batteries are places in 2 zipped pockets. It comes with 2 separate controllers. One with preset 30 programs. It’s super light, operated by remote control and ready to use. 2nd on is for those who likes tech and wants to add custom videos to it via software. 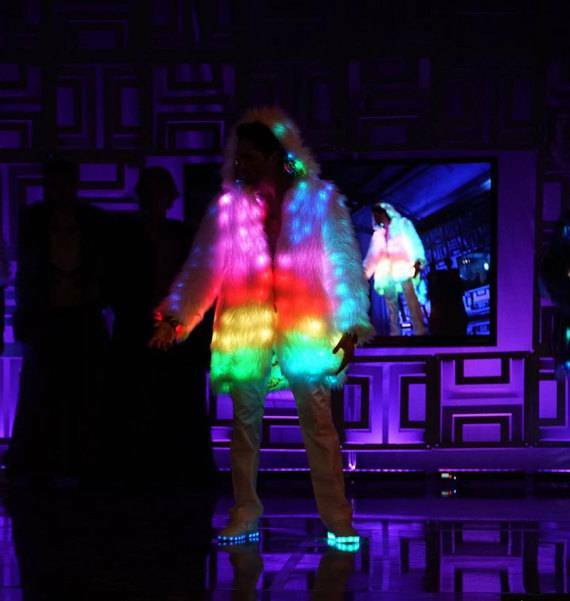 In the photo: Faux Fur + Fiber Optic + LED, size S.